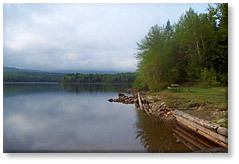 Third Connecticut Lake Home to rainbow and brook trout, lake trout and landlocked- salmon, Third Lake is located a mile south of the US / Canadian border along Route 3 in Pittsburg, NH. 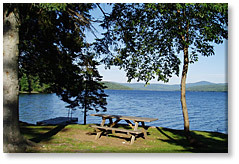 Surrounded by mountains and uninhabited shores, Third Lake is one of NH's most pristine lakes with depths up to 110'. T here is a good boat launch with parking located along Route 3. Fishing season opens on the lake April 1 and extends to September 30th. Ice fishing season is January 1 until March 31st. Daily limits: Lake trout, 2 fish over 18". Daily bag limit for lake trout and salmon is 2 fish (2 lake trout, or two salmon, or 1 of each) Salmon, 2 fish over 15" Trout, open water, 5 fish or five pounds whichever is reached first. Through the ice, 2 fish. No length limit. On Route 3 just five miles north of where the power lines end you'll find Second Connecticut Lake. 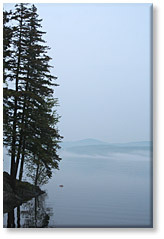 In the heart of Moose country, the lake spans 1286 acres with depths of over 60 feet. The lake is home to landlocked salmon and lake trout . There is a nice public boat launch and day use area on Idylwilde Rd. The small dam discharges its water coming from a depth of about 10 feet. While the water warms in the summer this section of river is better known for its nursery habitat of landlock salmon and brook trout. Fishing season opens on the lake April 1 and extends to Se ptember 30th. Ice fishing season is January 1 until March 31st. Daily limits: Lake trout, 2 fish over 18". Daily bag limit for lake trout and salmon is 2 fish (2 lake trout, two salmon, or 1 of each) Salmon, 2 fish over 15" Trout, open water, 5 fish or five pounds whichever is reached first. Through the ice, 2 fish. No length limit. 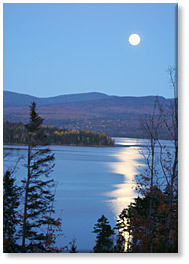 Spanning over 2800 acres with depths over 160' is NH's 5th largest lake, First Connecticut Lake. Home to lake trout and landlocked salmon, this beautiful lake draws anglers every year after ice-out in hopes of catching a trophy fish. Its mostly undeveloped shoreline combined with rugged mountain vistas make First Connecticut Lake a favorite destination for fishing, water skiing, tubing, or just a glorious pleasure cruise.. There are three public boat launches on First Lake. One by the dam; a good bet for larger boats, another across from the Cabins at Lopstick and a third at the end of Camp Otter Rd. The dam at First Lake is a 'tailwater' dam meaning its discharged water comes from a depth in the lake keeping river water cool all summer and providing excellent trout habitat. Fishing season opens on the lake April 1 and extends to September 30th. Ice fishing season is January 1 until March 31st. There is a well kept beach and picnic area near the dam. A truly great spot on a summer's day! Covering 359 acres and centrally located in the Connecticut Lakes region is Back Lake. With an average depth of only 7 feet, Back Lake is a smaller lake with numerous spring holes keeping this body of water a great spot to fish all season. Brook trout, brown trout, rainbow trout and small mouth bass inhabit these waters. 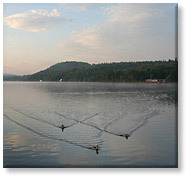 Back Lake is well known for its hexagenia hatch which occurs during the last week of June into the first week of July. To access the public boat launch, take Spooner Road off US Rte 3. The boat launch is a third of a mile in on Spooner Rd. Bass - 5 fish except May 15 to June 15. During this time, all bass must be returned to the water unharmed. Southernmost in the chain of Connecticut Lakes is the man-made Lake Francis. Built in the 1930s as an Army Corps of Engineers project for flood control, Lake Francis and its- impoundment, Murphy dam, are located just north of the village of Pittsburg. Murphy Dam is a 'tailwater' dam meaning its discharged water comes from a depth in the lake keeping river water cool all summer and providing excellent trout habitat. There are two public boat launches on this lake; one along Rte 3 and another on River Rd. 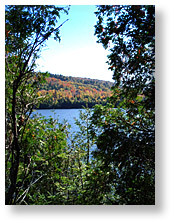 Lake Francis is home to Brook, brown, rainbow, and lake trout as well as landlocked salmon. Back Lake: Take Rte 3 to Beach Rd for this car-top boat launch. Parking, seasonal, 10 MPH restriction on this 539 acre lake. Trout and bass. 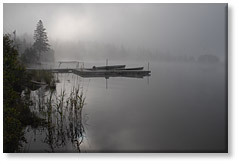 Back Lake: Take Rte 3 to Spooner Rd for this boat launch. Trailer parking, seasonal, 10 MPH restriction on this 539 acre lake. Trout and bass. Lake Francis: Route 3. 24 Hour trailer parking, No ski craft; trout and salmon live in this 2082 acre lake. Lake Francis: Take Rte 3 to River Rd (2 miles) 24 Hour trailer parking, No ski craft; trout and salmon live in this 2082 acre lake. First Connecticut Lake: Route 3 by the dam. 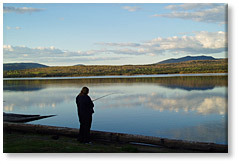 6 am to 9:30 pm trailer parking, Lake trout and salmon live in this 2807 acre lake. First Connecticut Lake: Route 3 to Camp Otter Rd. Limited trailer parking, Lake trout and salmon live in this 2807 acre lake. 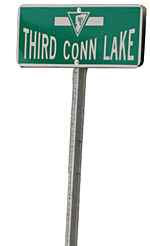 Second Connecticut Lake: Route 3 to Idylwilde Rd. 6 am to 9:30 pm trailer parking, Lake trout and salmon live in this 1286 acre lake. Third Connecticut Lake: West side of Rt 3, 1 mi S of Canadian border. Seasonal, 24 hour cartop parking. Trout live in this 289 acre lake. Boundary Pond: Rt 3 to East Inlet Road, bear right at the T and stay on road to Boundary Rd Remote cartop parking. Fly fishing only; trout live in this 19 acre pond. East Inlet: Route 3 to East Inlet Rd, bear right at the T. 24 hour trailer parking, trout live in this 43 acre pond. Middle Pond: Route 3 to Back Lake Rd to Moose Pond Rd. Car top seasonal parking, trout live in this 10 acre pond. Moose Pond: Route 3 to Back Lake Rd to Moose Pond Rd. Car top seasonal parking, fly fishing only, trout live in this 10 acre pond. Round Pond: Route 3 to Round Pond Rd, bear right at the fork. Car top parking, trout live in this 62 acre pond. Scott Bog: Route 3 to East Inlet Rd, bear left at the T. Go 2 miles then left at fork at the T. 24 hour trailer parking, fly fishing only, trout live in this 43 acre pond. Pittsburg preserve, Fourth Connecticut Lake, has a floating bog and plenty of insectivorous plants. It is the beginning of New England's longest river, Connecticut River. 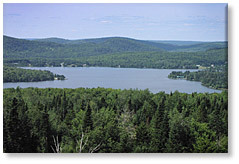 It is a water shed consisting of 78.1 acres that straddles the border of Quebec Canada and New Hampshire. It's protected by conservation easment of The Nature Conservancy. It's owed by the State of NH and considered a part of the Connecticut Lake Headwaters Natrual Areas. No hunting, trapping or fishing. Route 3 North, 22 miles past Pittsburg village to the US/Canada border. Park across the road from the U.S. Customs station. The trail begins on the same side as the Customs station, about 50 yards on the right of the building. There's a small kiosk at the trailhead.